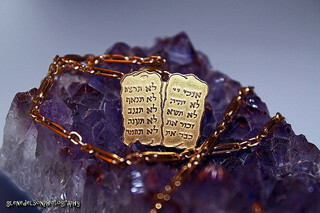 Ten Commandments by Glen Edelson on Flickr. Some rights reserved. One of the themes I know I repeat comes around at Covenant Sunday every year. It’s the notion I like to advance that tries to deal with the fears we have in making such solemn and even radical promises to God. And that thought is the one that points out – virtually every year – that the human side of a covenant with God in the Bible is always a response to his great acts of mercy, love and salvation. We only enter into a covenant with God because he has already done so much for us. That is the position the Israelites find themselves in when we come to our first reading in the Covenant Service, from Exodus 24. God has saved them from the terrors of the Egyptian Pharaoh. The commandments are only given in the Old Testament after that act of salvation. They are not being required to do something good so that God will feel favourably disposed to them: God loved them before that, and unconditionally. As we consider God’s call on us as disciples of Jesus again this year, we remember that as our starting-point: God acted to save us before we did anything for him. It isn’t slavery in Egypt and the parting of the Red Sea in our case, it’s slavery from sin and the parting of the waters of death. So the first point I want to make this morning is precisely that: yes, today is a day when we are called to reaffirm our obedience to God. We might not like it, but we do so because we already know God loves us. He loves us beyond measure. As Christians, we would go beyond the Exodus text and say that he loves to the point of his only begotten Son taking on human flesh, and living and dying for us. This is the love by which God sets us free, and this is the love to which we respond today by offering our obedience. Some of us might find it helpful to draw an imperfect parallel with parenting. We ask our children to do what we require of them, but we do so out of love. We ask our children to obey us, because we love them and because we have already shown that love sacrificially for them, and indeed we shall go on loving them at great cost to ourselves. That is the love that calls forth a child’s healthy response to parents. And it is similar in the life of the Spirit, as I have said. We gather to make these promises today, because we know a God who loves us to the uttermost in Jesus Christ. He doesn’t simply say to us, “Do this, because I say so,” he says, “Do this, because I love you.” That makes all the difference in the world. So the commandments are the first feature of the covenant, from our perspective, and they are our response to God’s redeeming love in Jesus Christ. The second feature of the covenant in Exodus 24 is blood. We read about the animal sacrifices made by the Israelites, and how Moses divided the blood between the basins and the altar. You might expect me to make a point here from a Christian perspective about the sacrificial death of Jesus Christ for our sins, but that isn’t quite what I’m going to say – apart from the fact that I have already alluded to that in talking about the level of God’s committed love for us in the first point. Christian Student Fellowship by Jeremy Wilburn on Flickr. Some rights reserved. Actually, there were several kinds of sacrifices in the Old Testament, and the ‘sin offering’ was only one. Here, we have ‘offerings of well being’ (verse 5). Other translations call these ‘fellowship offerings’. They are offerings that express something about the relationship between God and the people. They do not so much make the relationship by dealing with the barrier of sin as show that the relationship already exists. Furthermore, in the context of a covenant, the shedding of blood is significant. In ancient times, a covenant was sealed with blood. We may seal an agreement with signatures, or perhaps a solicitor will attach a wax seal to something particularly serious, but go back three thousand years or so and you will find people sealing covenants and solemn agreements with the blood of an animal. So – this may not be the way we do things now, but the essential message for us to take from this in the passage is our relationship with God has been sealed and confirmed. Our covenant is, of course, sealed in the blood of Jesus Christ on the Cross. His death does not only mean the forgiveness of our sins, it means a permanent relationship of mutual commitment has been settled. Through the Cross, we become not only forgiven sinners, but disciples and friends of Jesus. In other words, this is what we say in the Covenant Prayer when we conclude with the words, ‘you are mine and I am yours.’ It is a declaration of such close fellowship with God in Christ by the Holy Spirit that we are united. The covenant is not simply an exchange of deeds – God’s salvation and then our obedience – it is the making of a deep and lasting relationship. Can it be broken? The Old Covenant was broken by God’s people, as we heard in Jeremiah 31. Some say the New Covenant cannot be broken, but John Wesley said it could – albeit only in extreme circumstances. Again, think of the parent-child relationship. When that has been built on sacrificial love, it takes something extreme to break it completely. Wrong-doing can seriously weaken it and make parent and child distant instead of close. Likewise, it takes something on the scale of our utter rejection of God to break the fellowship of the covenant. We can by our sin weaken the relationship so that it is not as close, rewarding and joyful as it could be, but that should not make us complacent. Instead, would it not be good to think that as we renew our covenant this year, we commit to building and strengthening our relationship with God through the use of spiritual disciplines (what Wesley called ‘the means of grace’) and by doing his will? 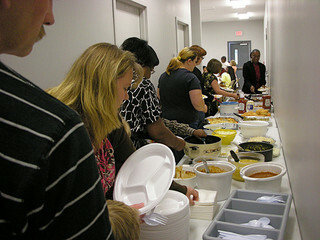 Pastor Appreciation Sunday by Judy Baxter on Flickr. Some rights reserved. You have the close fellowship, culminating with those words, ‘and they ate and drank.’ You can soon think of other biblical examples of people ‘eating with God’, even if not quite so directly. The Passover meal. Jesus dining with sinners. The Lord’s Supper – of course. The wedding feast of the Lamb and his Bride in Revelation. It’s very physical and material, hardly the ethereal, spiritual occasion that many assume a religious experience to be. No wonder C S Lewis called Christianity ‘the most materialist of all the religions’. Again, in ancient times, after a covenant had been sealed with the sprinkling of blood, the parties to the covenant would sit down and feast together. We shall do this at the climax of our service with bread and wine, although when we speak of the sacrament being ‘a foretaste of the heavenly banquet prepared for all people’ and then swallow a tiny piece of bread and a thimbleful of wine, it is a pretty microscopic foretaste! This God enjoys our company, meets us in the ordinary and necessary areas of life, and transforms the mundane into feasting. This God turns everyday grey into multi-coloured celebration. Most of all, perhaps, the thought of us sitting together and feasting with God confirms the notion that the covenant has brought us into a family. Like a family sitting down to eat in the evening when everyone has come in from school or work, so we reflect together on what we have done with God and what we shall do tomorrow with him. And we do that with food and drink, bread and wine, at tables and in cars, in homes and in shops, breathing air and using our five senses, because we can not only taste and see that the Lord is good as the Psalmist said, we can also touch, see, smell and hear that he is good. We live out this relationship which the covenant has established and confirmed not waiting for heaven but seeking to do his will on earth as it is in heaven, all the while giving the world an advance taste of the new heavens and the new earth which God will bring with the resurrection of the dead at the end of all things as we know them now. What does this have to say to us as we renew our covenant this morning? We are called not only together into the fellowship of the church with God but also to go into the world with him and celebrate his love there. We can find him in the normality of daily living just as we can also find him in the specialness of Sunday morning. And as we encounter God in the physical world, so we rejoice in that love as we turn material things back into the stuff of his kingdom. May that be what each of us does this year. Posted on January 4, 2014, in Sermons and tagged Covenant Service. Bookmark the permalink. Leave a comment.